From The Star-Ledger. 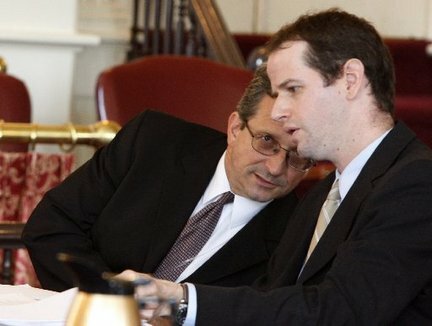 In the picture, Bill Clayton, assistant CEO of Greystone Park Psychiatric hospital, left, talks with assistant attorney general Gerard Hughes. TRENTON, N.J. — New Jersey is too broke to move 1,850 people with developmental disabilities out of institutions in the next five years, so a lawsuit demanding it do so should be dismissed, an attorney representing the state said Sept. 22. The case stems from a federal Supreme Court ruling that says federal law protects the right of disabled people to live in "the most integrated setting’’ safely possible. "Making these placements would be financially devastating to the state," said Deputy Attorney General Gerard Hughes, who represented the state Department of Human Services in federal court in Trenton. But a lawyer for the other side said that’s no excuse. "Every state says ‘we don’t have the money now,’" said Samuel Bagenstos, a deputy attorney general from the U.S. Justice’s Department’s civil rights division. Bagenstos was dispatched from Washington, D.C., to testify for a legal advocacy group, Disability Rights New Jersey, which brought the suit. The group wanted U.S. District Court Judge Anne Thompson to rule the state was violating the Americans with Disabilities Act and order it to move people into the community. The state offered its empty pockets defense after Thompson refused to allow a more controversial approach: that the state cannot be sued and the 20-year-old disabilities act violates states’ rights and should be declared invalid. Thompson barred that "sovereign immunity" defense last year when the state offered it to fend off a similar lawsuit. That lawsuit, also brought by Disability Rights New Jersey, alleges Human Services is violating the disabilities law by not reducing a housing waiting list for some 8,000 disabled people, many cared for by their elderly or sick parents. The judge told both sides to expect to go to trial. In May 2007, Human Services Commissioner Jennifer Velez released "Path to Progress," a plan describing how the state would comply with the U.S. Supreme Court’s 1999 Olmstead decision. It called for discharging 100 people the first year and 250 people every year after until 2015. The plan would cost about $1.3 billion in state and federal funds, with more than $500 million coming from downsized developmental centers. Jeffrey Carr of Princeton, a volunteer attorney working with the disability rights group, said case law requires the state to show it has "a working plan" and is making progress following it. But since 2008, the state has relocated only 63 people, Carr said, citing Human Services data. "The plan is simply not working,’’ he said.